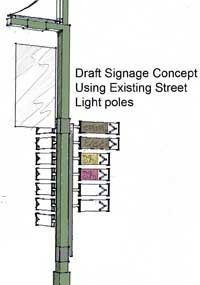 Graphic courtesy of Ben Young Landscape architect and graphic designer Ben Young presented a preliminary design to Ketchum’s Planning and Zoning Commission on Monday that would attach wayfinding signs to existing downtown light poles. Commissioner Michael Doty suggested that signs for government locations, such as the post office and City Hall, be a little longer to differentiate them from retailers’ signs. Ketchum took a step Monday toward attaching small signs to existing downtown light poles that would point in the direction of retailers and other tourist attractions, making it easier for visitors to navigate Ketchum. Landscape architect and graphic designer Ben Young of Ben Young Landscape Architecture put together—at no cost to the city—a basic design for these signs, presenting it to the city's Planning and Zoning Commission on Monday. He left the details up to the city as to whether storeowners would have the freedom to use a tailored logo on their rectangular sign or must use a specific font and no graphics. The P&Z was split over how to balance creative freedom and the need for some kind of uniformity. Young suggested allowing businesses to use their own original designs in the main space of the sign, but the arrow pointing in the direction of their location would be standard, serving as a "punctuation mark" wrapping it all together. "If you do something like this, quality matters," Young said. "It has to represent the quality of the businesses you're advertising." Despite the P&Z members' differences over sign design, they agreed it's a worthwhile alternative to sandwich-board signs cluttering sidewalks and creating a hazard to pedestrians. It would also be more attractive and better accomplish wayfinding, a need identified in the city's downtown master plan. Commissioner Rich Fabiano called the design "a great start." "This would be a great addition to our city," he said. Young said his preliminary design enables each sign to have its own frame holding it to the pole. That would allow each pole to have as many signs as demand calls for up perhaps six. If the demand isn't there at a pole to fill all six slots, a sign and its frame could be removed so there aren't unsightly blank signs. Plus, he said, a business' sign could be slipped in and out of the frame with little effort. Young said his study has identified 19 light poles in Ketchum's retail core that could be used, but suggested using only a couple to begin with as a trial run, possibly at the corner of Sun Valley Road and Leadville Avenue. The P&Z asked Young about the best process for deciding who gets the most sought-after slots, would the city control the process, what would the prices be and so forth. Young didn't have all the answers but suggested that municipal buildings and locations, such as the post office and City Hall, would have dibs on the top sign positions. However, he was unsure on how to determine sign prices and if pole positions would have varying prices. "It could be market driven," he said, putting a higher price on the demanded sign positions. "The whole mechanics of the process have to be flushed out." Commissioner Fabiano suggested that the follow-up meeting be a joint one of the City Council and P&Z since both groups would be decision makers. The joint meeting will be scheduled for sometime in January, with Young coming back then possibly with a sign model. Fabiano suggested involving the business owners in the discussion since they'd be the ones buying the signs. However, Commissioner Sam Williams said, it's too early for that. "They will immediately ask, 'Where's my sign, how much is it going to cost me and when will it go up?'" Williams said. "We don't know. We don't know. We don't know."